I really don’t like the cabinet that the telly sits on. However, it is the right size and the cupboard is great for hiding away the computer and stuff that runs with it. The heavy mango wood of the cupboard just doesn’t go with the rest of the decor in our living room. I needed to give it the Pillarboxblue treatment. Which basically involved colour, decoupage and a hint of Marimekko. So out came the best chalk paint (in Emperor’s Silk) and some Marimekko napkins for a colourful cabinet upcycle. Now when I watch telly in the evening, I no longer sit there frowning at the ugly cabinet. I already had some chalk paint left over from another project so the only cost was a few pennies for the Marimekko paper napkins. Trouble is, I think my upcycled cabinet maybe too good for the telly now. 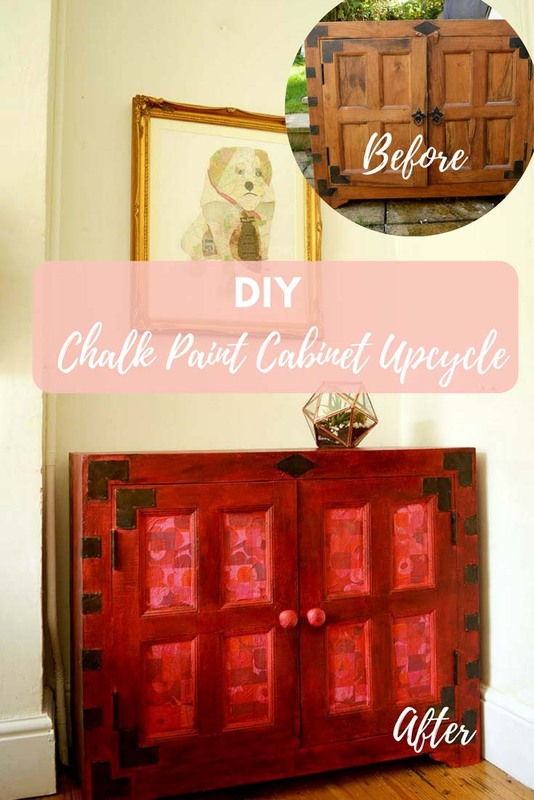 The reason I love chalk paint so much besides the finish is the fact that you don’t have to do any prep. Yes, that’s right no sanding or priming. I did, however, give the cabinet a good wipe down before painting. Make sure you cover any bits of the cabinet you don’t want to be painted with masking tape. Such as the hinges and any ironwork. 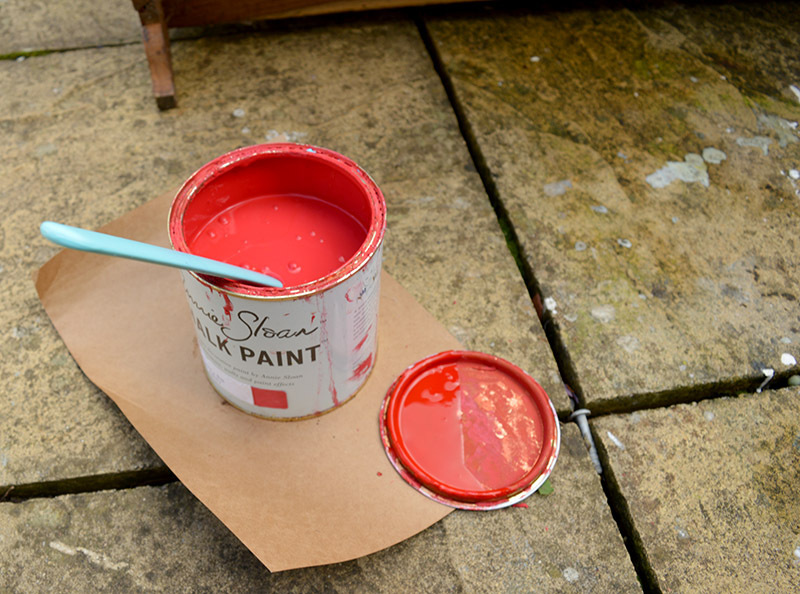 In the past when painting with chalk paint I have always used the approved chalk paint brushes. However, when I updated my kitchen painted worktops with a mini roller I fell in love with the tool. With the mini roller, the paint went on so quickly and smoothly I decided to use it for this cupboard upcycle. The paint coverage with the roller was thinner than it was with a brush therefore, I used 2 coats of Annie Sloan Emperor’s Silk chalk paint. 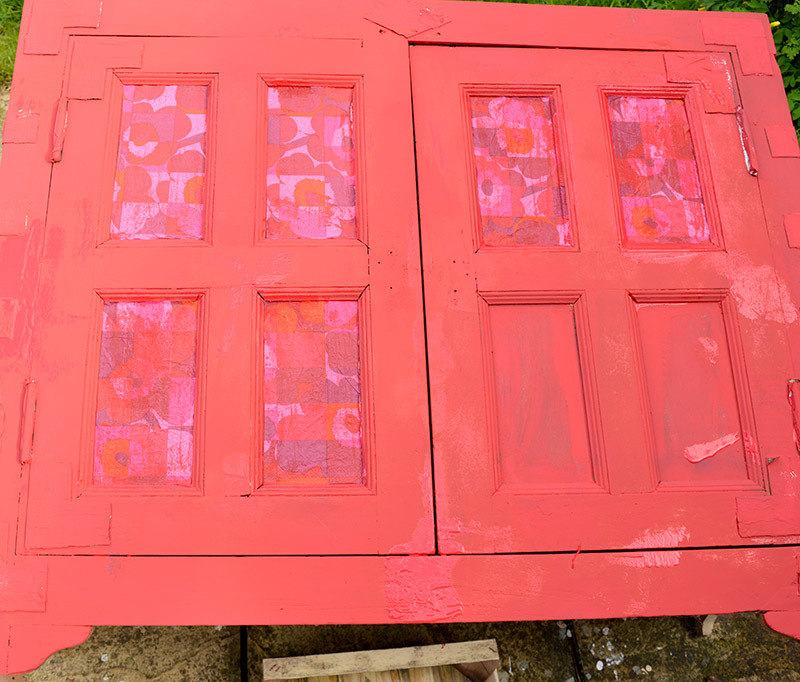 For the Marimekko part of this cabinet upcycle, decoupage the paneled doors. 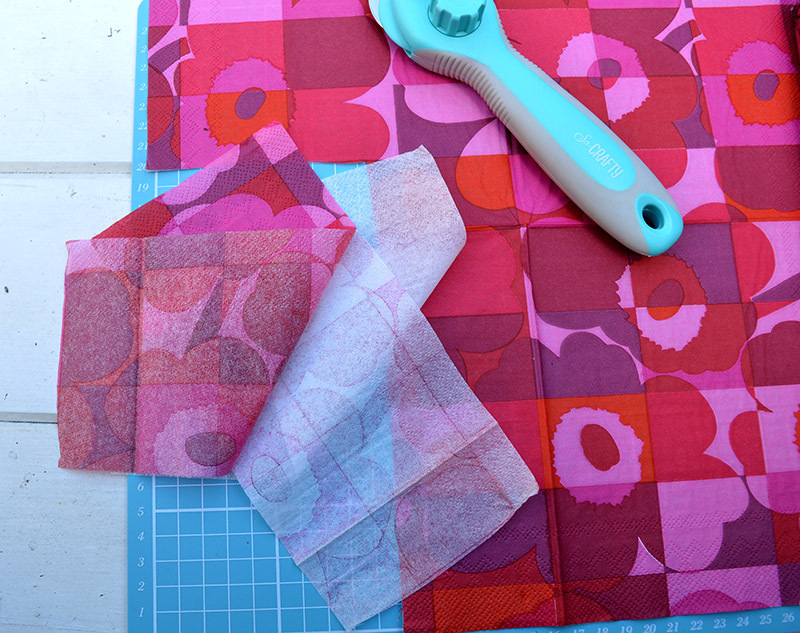 Cut paper Marimekko napkins to fit the size of the panels. Then carefully separate the 3ply napkins so that only the top printed ply of the napkins is used. 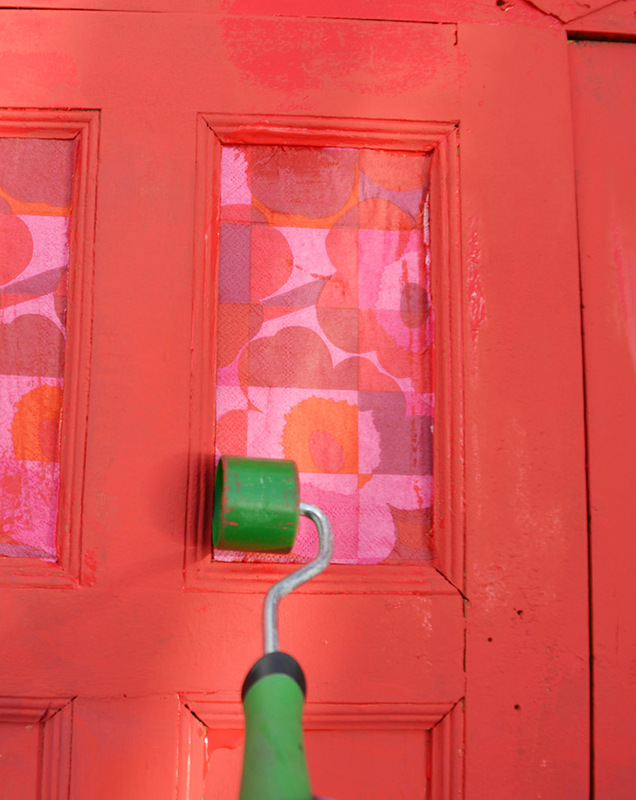 You can either wait until the chalk paint is dry and use decoupage glue to stick the Marimekko napkins to the door panels. Or do as I did and stick the napkins to the wet chalk paint using the paint as a glue. Either way, make sure you use something like a small roller to flatten out any paper creases. To match the cabinet I painted and decoupaged 2 wooden door knobs with the same paint and Marimekko napkins. 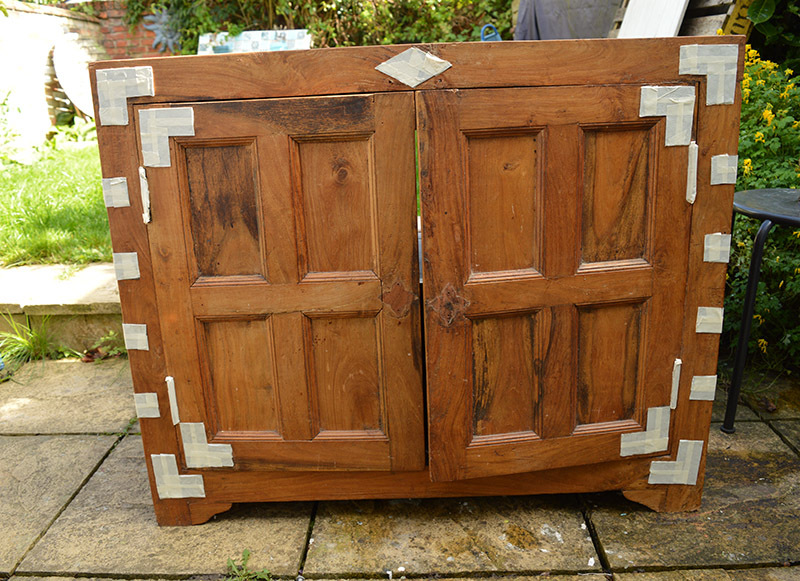 Finally to protect the chalk paint of the cabinet upcycle use Annie Sloan’s furniture wax. 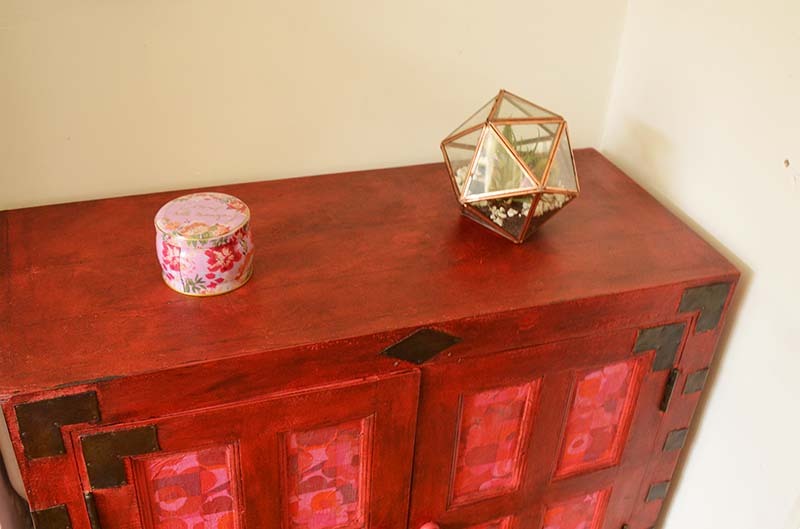 I used a dark furniture wax to give the red cabinet a richer more antique looking finish. The wax is simply applied with a brush and then buffed with a lint-free cloth. What a great color and the inserts are such a fun detail. Thanks, Claire, for sharing with us at Celebrate Your Story, and have a great weekend. As I think almost everything is better red (apart from traffic lights when you are in a hurry) I an genetically predisposed to think this is amazing! I love the serviette addition too, with out them it would be lovely, now it is fabulous. Thank you, Julie. I just realised that this cabinet encapsulates both my Chinese and Scandinavian roots. The red chalk paint has the antique Chinese lacquered vibe to it and the Marimekko napkins the Scandi element. Thanks for sharing your project at #fridaysfurniturefix Claire, love the design pairing. Always a pleasure having you drop in! Thank you so much, I look forward to seeing it. Thank you so much Michelle. I do like the brighter colour. Thank you, Lins. 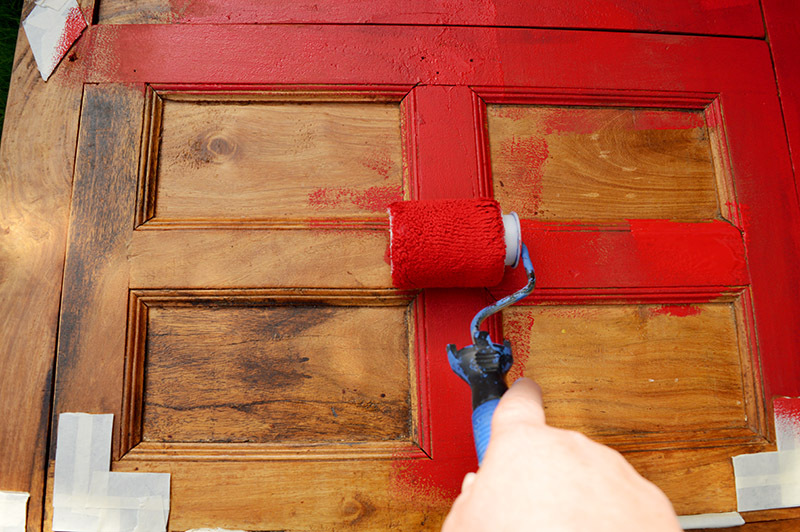 It’s because the red waxed paint looks like traditional Chinese red lacquer. Thank you, Caro. I also find that Annie Sloan paint goes a long way. We have a few of those antique Chinese wedding cabinets in our family too! I was born in Hong Kong and my family lived there for the first 30 years of my life and collected a lot of the red antique Chinese furniture which we still have today. That is really a distinctive and eye-catching style! Isn’t it amazing how napkins transform a piece? Looks like you did a good job on it! Thank you so much. It is amazing what you can do with a paper napkin. I’ve always wanted a red accent piece in my home. Yours is pretty awesome! I’m still trying to find the right piece of furniture to transform. Thank you Laurie. I like to have a flash of colour in every room. This cabinet looks wonderful in red and the use of the napkins adds the perfect touch! Beautiful job, Claire. Pinned! Thank you, so much Angie! Such a nice makeover. I appreciate the tip about the roller. What a fabulous makeover! Love the colour and how you have popped the serviettes in the inserts of the cupboard. Thank you, Sam. I love the fact that you called the serviettes and not napkins. Serviette is obviously Aussie as well as English! 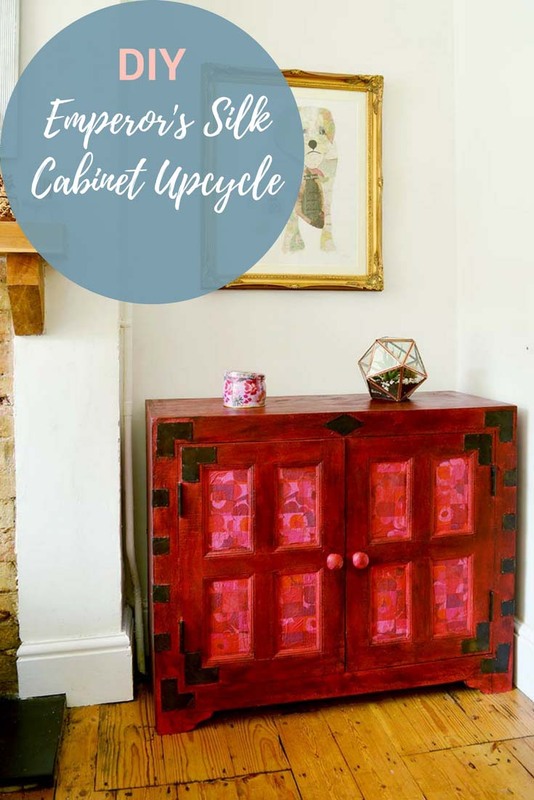 What a great project and now your cabinet is quite the stunning statement! I love anything from Marimekko! 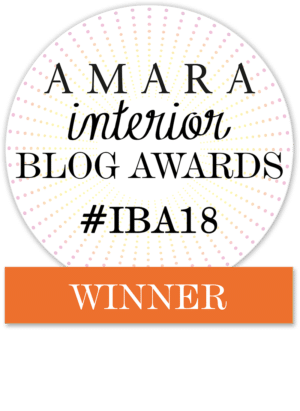 Thank you, I’m a sucker for Marimekko. 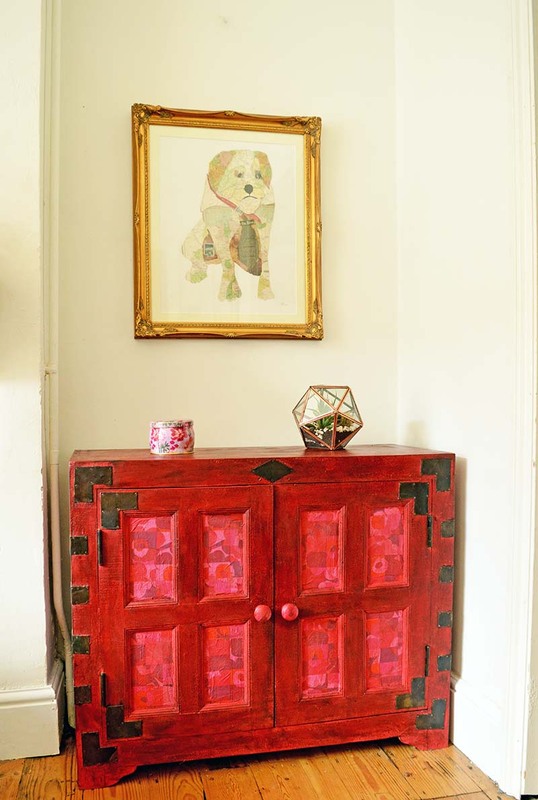 Thanks for sharing your fun red cabinet at Vintage Charm!